With Christmas fast approaching, all our thoughts turn on to, what do we buy the little one this year? I’ve now got a baby and 2 year old (who will be almost 3 by Christmas) to buy for. Although Henry will have no idea what’s going on, we can’t do what we did when Oliver was a baby and not buy anything, as Oliver will want Henry to have presents too! I have compiled together a list of items I think would make great gifts. First up, there’s this stunning balloon from Bubblegum Balloons. If you have a child, you will know that there is nothing better for them than a balloon. This balloon has kept Oliver endlessly entertained and Henry has been absolutely captivated by it. Although a little pricier than your average ‘card shop’ balloon, it makes up for the cost in the detail. 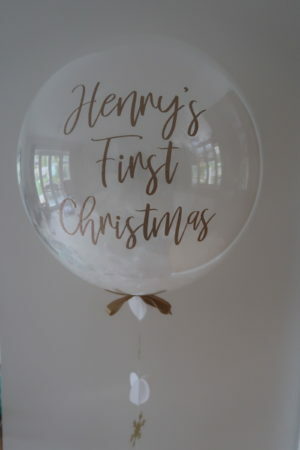 We were sent this gorgeous ‘Baby’s First Christmas‘ which can be personalised with your childs name. It is partially filled and is a lovely decorative feature. The balloon lasts well for around 3 weeks, so you can order it in advance of the day. It comes inflated in a big box, and will pop out when you open it, perfect to wrap up! Another great product to buy for a baby would be smellies. As parents we can never be more grateful for smellies, wipes, nappies etc. as gifts! Check with the parents before gifting whether there is a certain brand they use. Johnson’s Baby do a variety of gift packs which are perfect to give little ones over Christmas. 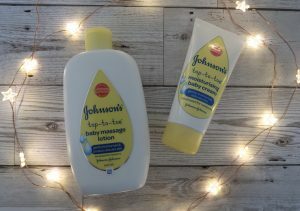 I love using their ‘top to toe’ baby massage lotion, great for a little massage at bedtime! If you or your friend have a teething baby, teething goodies are always well received. 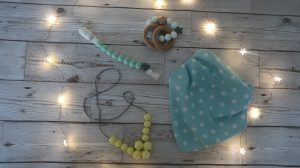 This gorgeous teething ring from Nibbling is perfect, as well as a teething dummy clip and teething necklace. I know I would be so pleased with these goodies. And a gorgeous dribble bib from Bibetta would round the gift off nicely. 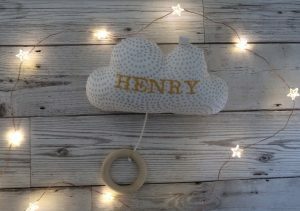 For something a bit special, what about this GORGEOUS cloud mobile from Petrichor Handmade in London. I ordered this one for Henry, and he loves it (as does his big brother, he adores pulling the cord to play the tune!) You can choose from a variety of beautiful tunes and it’s just lovely to hear them. It really is the most special gift, and I don’t know anyone who wouldn’t be pleased receiving one of these! They’re all lovingly handmade and fully personalisable. 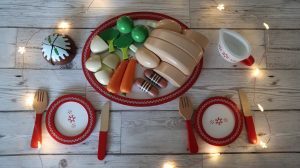 Well what better to gift than a Christmas Dinner? 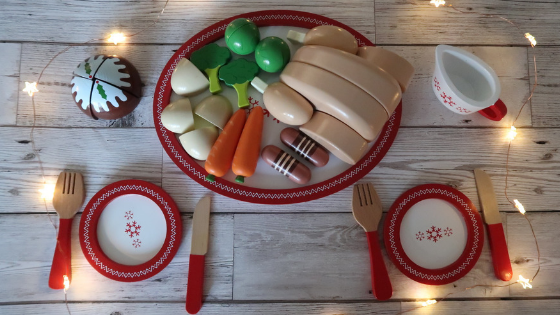 I’ve had my eye on this gorgeous wooden Christmas dinner set from JoJo Maman Bebe ever since I saw it. It’s just the perfect piece to add to your little ones play kitchen set! 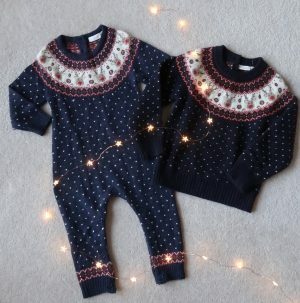 Finally – Christmas jumpers – a big staple for Christmas Day. JoJo Maman Bebe have the most gorgeous selection and they’re all so soft. The matching jumper and all in one are great for a toddler and baby, they’re lovely and snuggly and just darn cute! Some of these items have been sent to me for inclusion in this gift guide and some I have paid for out of my own money. All words and opinions are my own.